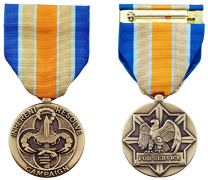 Inherent Resolve Campaign Medal Awards are sold as one per pack. The box set consist of the large medal and ribbon mounted inside the presentation box. On a bronze disc 1-1/4 inches (3.18cm) in diameter within a textural circle, a quatrefoil with an erect dagger enfiled by a scorpion held by a mailed hand and arched above and on either side of the scorpion's tail, the words “INHERENT RESOLVE” and centered below, the word “CAMPAIGN.”On the reverse side, a single arabesque polygonal star surrounding radiating points from the center, superimposed by an eagle perched on a rectangle with wings expanded and inverted, inscribed “FOR SERVICE." The ribbon is blue, teal, sand and orange. This color combination is inspired by the colors of the Middle East landscape and the Ishtar Gate, the eighth gate leading to the historic inner city of Babylon. Symbolism-The decorated star panels are common in the Arabian and Moorish styles of ornamentation. The scorpion, symbolic for treachery and destruction, is found on most major land masses. The dagger alludes to swiftness and determination. The eagle represents the United States and is symbolic of might and victory.